You will learn new techniques in each 3-hour session to complete four beautiful book structures along with a lined slipcase to hold your treasured prototype collection. All of the skills can be 'mixed and matched' so that you have a myriad of design possibilities. These classes are booked as a block but if you would like to attend one or more as a 'taster' email me and I can advise you on space availability. All materials are included in the fee and for this programme you will also be provided with the materials to do your optional 'homework'. Sew Much to Do has a wonderful crafting room for us to use above the shop. Please be advised that there is one flight of stairs to reach the room. Parking is available in Ely's public car parks. 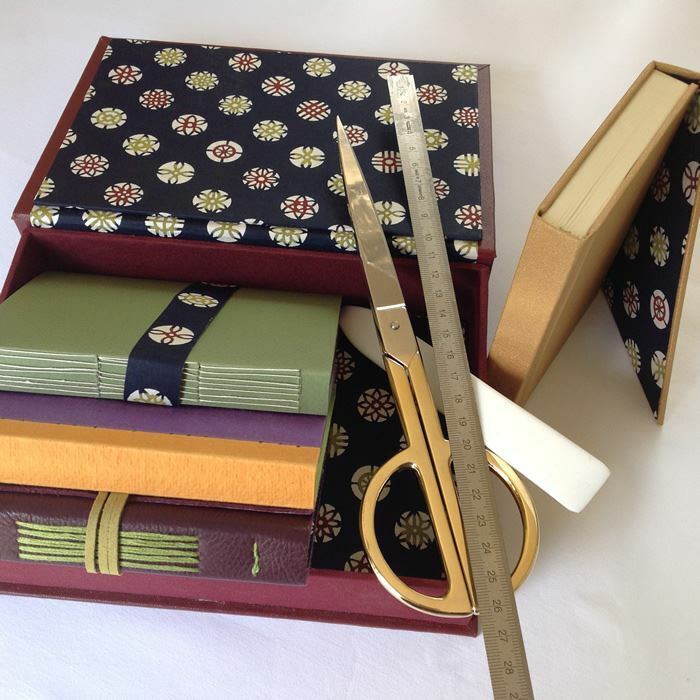 Wrapper (suitable for use on old and damaged or new books) and Tue-mouche (Posh Paper), all held together in a lined and lidded box. 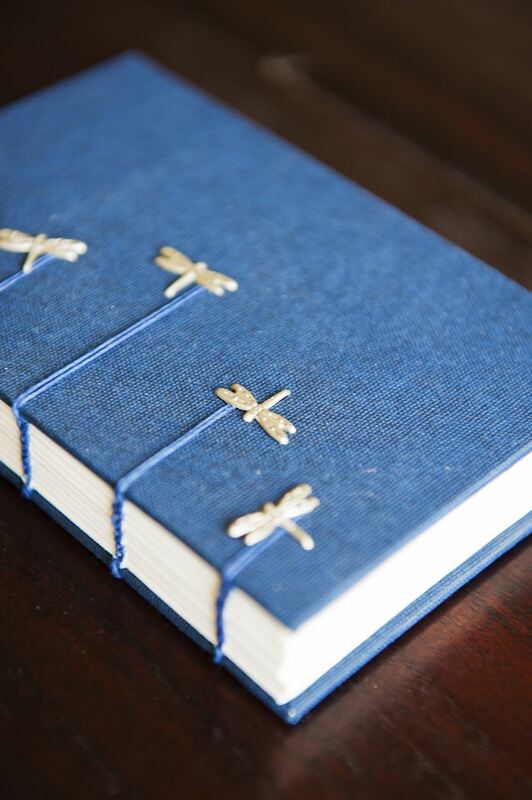 These books make gorgeous gifts and, as with Beginning Bookbinding, the techniques and skills are interchangeable allowing you to develop your own creative finishes. The class is designed for beginners and it is not necessary to have any previous experience. This series focuses on more 'artsy' structures whilst Beginning Bookbinding focuses on more 'everyday' styles. The classes can be taken in any order. We will use the beautiful orchard surrounding Stapleford Granary for some of our source materials, and spend the morning creating our cyanotypes. Cyanotypes are negative prints of an object, in this instance flowers/plants, in the recognisable ‘blueprint’ colour. Cyanotypes are produced from a camera-less photographic printing process developed in 1842 by Sir John Herschel, St. John’s College/Cambridge graduate. Your favourite cyanotype from the morning will then be used as the covering material for your hardbound book made after lunch. This is a wonderful opportunity to create a unique one-off personal design for your book/s. 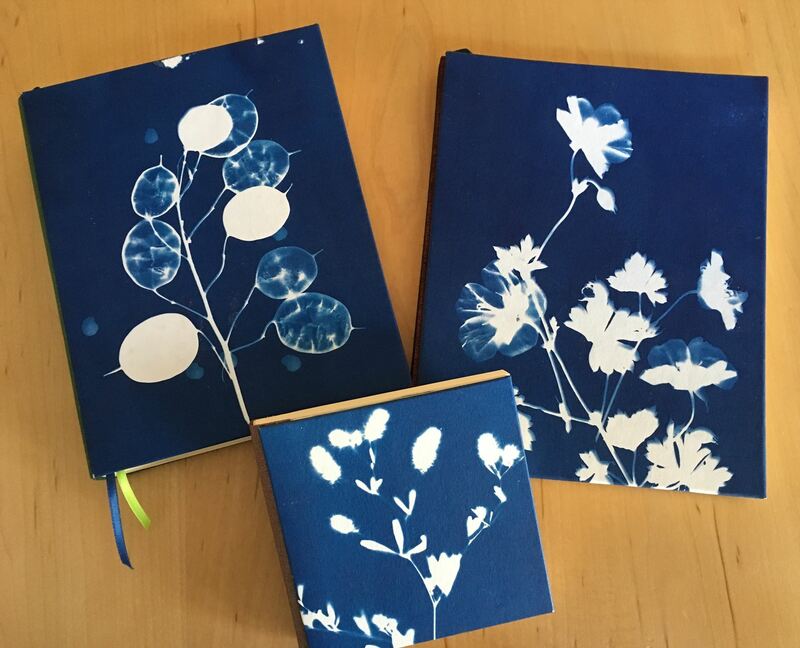 All materials are provided and you will leave with the skills to continue practicing your own cyanotype photography and to reproduce the style of book again at home. This binding is one of the earliest 'book' shaped bindings dating back to China in the 14th century. 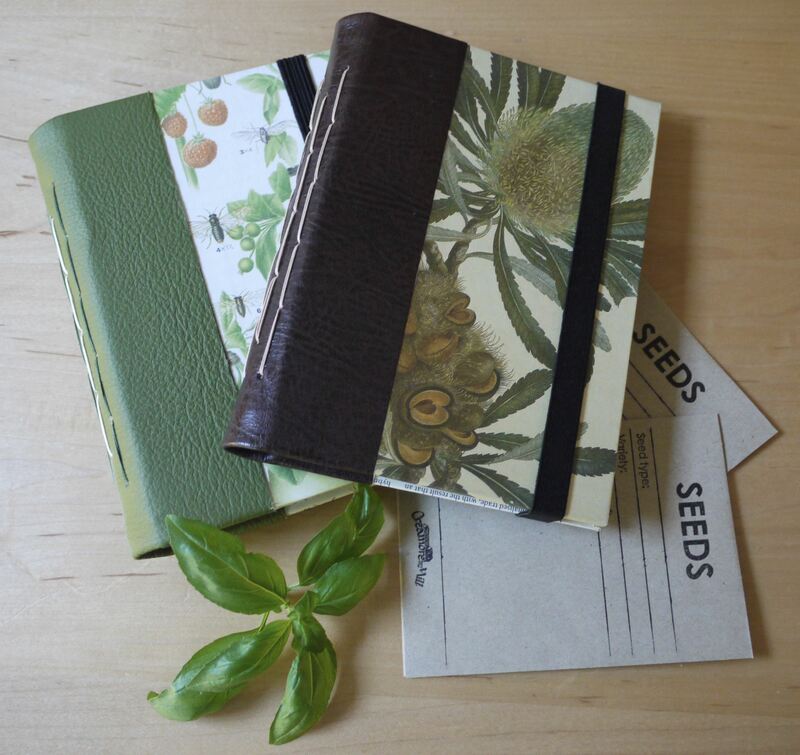 Today these books are used as sketchbooks, notebooks and with a little extra reinforcement, which you will learn in this class, albums or scrapbooks. 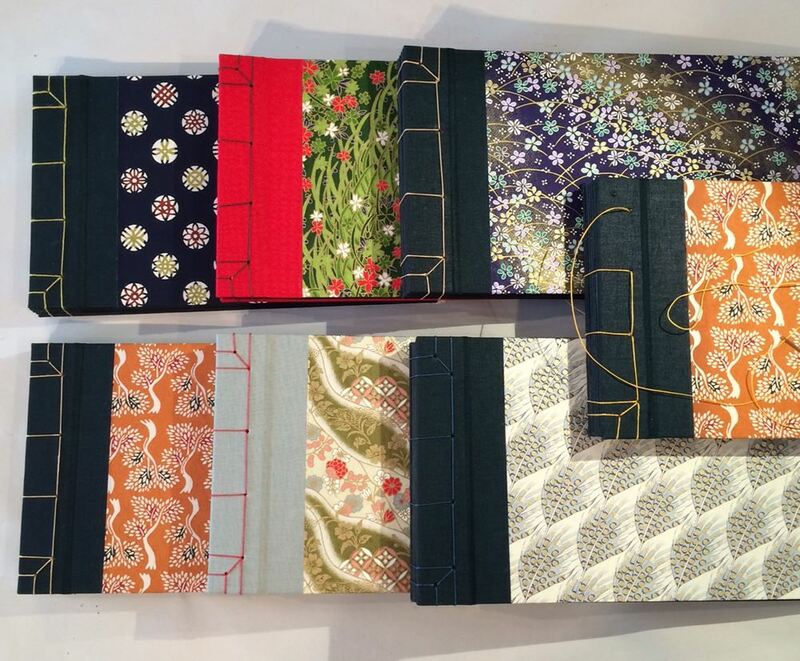 During this workshop you will learn one of the four stitch styles used in traditional Japanese bookbinding . These are beautiful structures to which you can add a variety of creative finishes. You can also design your own stitch patterns! Suitable for beginners. This workshop will take place at The Lodge Flower and Craft School, and ideal venue in a wonderful and peaceful location.